Tammy caught the fiber art and stitching bug early...by age 5 her creative mother, JoAnn, was teaching and enabling all of her creative interests. She began sewing for Barbie, stitching needle-point florals for grandma, altering and embroidering her own jeans. Learned to knit with mom in 6th grade. She was the consummate DIYer... making candles, perfume, jewelry, basket weaving, home decorative items, gifts and fashion. She excelled in junior high and high school sewing/stitching classes. She sewed half a dozen costumes for the school's production of "The Princess & the Pea". Tammy attend business classes and work program with her mall job at SoFro Fabrics. She entered and won a trophy in a business competition and even a medal down state. Upon suggestion of her guidance counselor, Tammy graduated high school a year early. Tammy immediately enrolled at Harper College - Palatine, IL in fashion design. 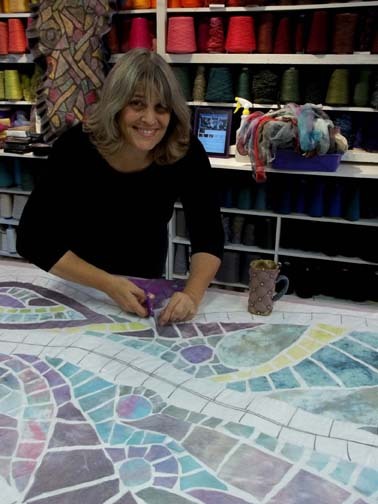 Her desire to "make" her own textiles/fabrics led her to Fiber Art at Northern Illinois University - DeKalb, IL. While an undergrad, Tammy received recognition for her costume design & construction work on several NIU dance and theatre productions. 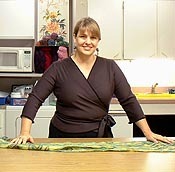 Tammy held an internship with a Chicago artwear designer who included several of Tammy's hand-woven fabrics in their collections and contracted her to machine knit sweater designs. Tammy's hand woven fabric was included in a dress for Oprah Winfrey's attendance at a celebrity wedding (she also wore it on her TV show). 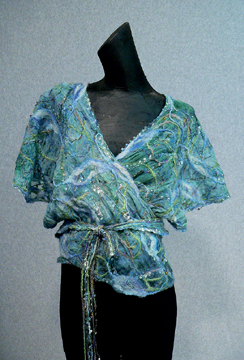 Tammy received a BS degree in Clothing & Textile Science (Major) with Fiber Art Minor in 1985. 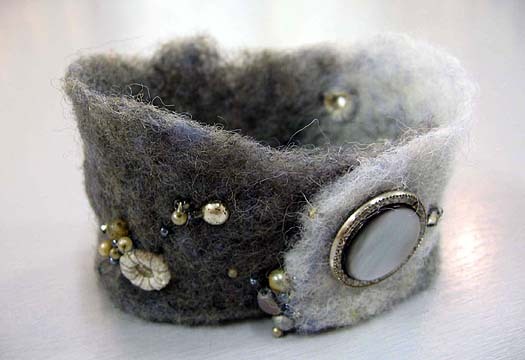 Tammy went on to post graduate studies blending the textile science & fiber art disciplines. She received a graduate assistantship position teaching Sewing Skills 101 and the T/A in Textile Science Lab while working on her personal concentration in wet-felting, hand weaving and knit wearables. Tammy founded her label, "TLD Designs" at the age of 22. She was immediately involved in the "indie" and "slow fashion" movement as she began making and marketing her one of a kind ArtWear pieces. 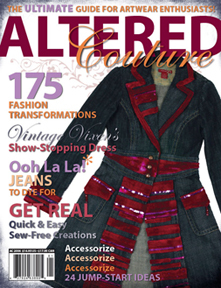 Her modest dream, at the time, was to simply sustain and support herself in textile fabrications and wearable art. Each item was, and continues to be, made by Tammy, one piece at a time. Pieces may include one or more of the following techniques: hand weaving, hand and/or machine knitting, hand dyed/painted yarns and fabrics, hand-made felt, laminated (Nuno) felt, recycled sweaters/textiles, appliqué, stitching, embroidery, assemblage, lampworked, enamel and/or fused glass. In June of 1988, in partnership with her mother, JoAnn, Tammy opened her first mini-boutique within a "retail incubator" located in Chicago's historic "Oldtown" neighborhood. From their 50 square foot retail space, they sold jewelry, apparel, accessories, fine art and home decorative objects. Initially, all items were produced by the pair, but they quickly expanded that boutique allowing them the space to showcase the work of other Chicago area artists. In May of 1991, Tammy formed another partnership with wearable designer, Zully. The two ladies took over the "retail incubator" that housed their boutiques, Chicago Originals, Ltd. Tammy served as the director of operations, overseeing the day to day business activities and the full time staff for the 3 years they continued on Wells St.
September 1993, Tammy and JoAnn secured a commercial location in Westmont, IL -- a close suburb of Chicago -- and TLD Design Center & Gallery was created. Initially, the space was a gallery setting for their own work and maker's studio for Tammy. The Gallery opened to the public within 12 mos and in response to repeated requests, Tammy began offering creative art classes leading with Beginner Level Weaving Skills, knitting and felt making. 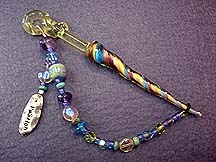 The Design Center hosts classes in a variety of mediums taught by Tammy, as well as, other local Artisans. The Westmont Gallery & Yarn Shop is open Wednesday through Saturday 11am to 6pm (no appointment needed for shopping) Tammy is on hand daily (when not scheduled away at a fair or event) teaching, making, Dyeing Yarn, up-dating class schedules and social media. 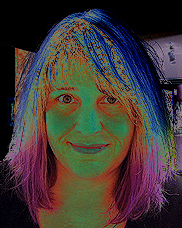 Sadly, JoAnn H Deck passed away December 29, 2013 JoAnn lives on through her body of work which continues to be exhibited in various venues installed by Tammy. 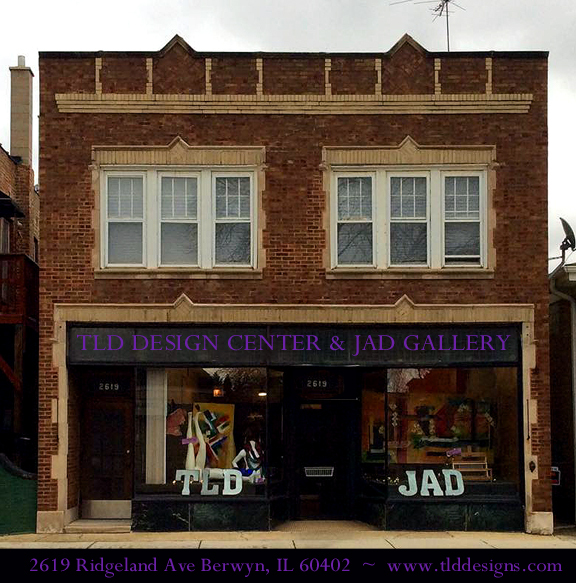 On August 11, 2015, a Live/Work building was purchased in Berwyn, Illinois and Tammy opened her second location for TLD Design Center & JAD Gallery. Classes and Gallery Exhibits are now available in both locations. April 2018, Tammy launched her new Line: " Purple Cat Art" which includes hand painted yarns & warps, hand knitting, felting and weaving patterns and kits....with more artful merch on the horizon. Sleeveless Wrap Top together with several scarves. 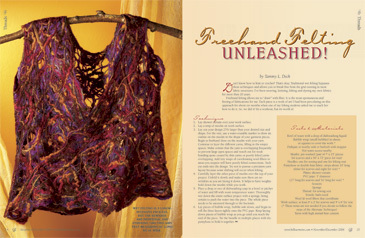 March/April 2006 - "Belle Armoire" Magazine "Arboretum Shawl" a felted Silk piece shaped like a Fall Leaf. 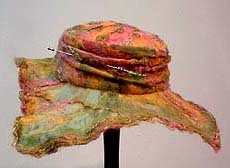 Summer 2003 - "Belle Armoire" Magazine "Summer Social" a square brimmed Felted Silk hat and "Trellis" a Felted Silk, lattice patterned shawl. In November of 2004, Tammy shot two segments for the HGTV show "Crafters Coast to Coast" which initially aired on April 19, 2005 and re-aired on October 13, 2005. The show has been renamed "That's Clever" and aired on March 28, 2006. 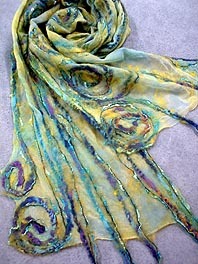 In the episode, Tammy demonstrates the creation process for her felted silk scarves and her glass hair/scarf/hat accessory she calls a "Passion Twist"
1991 - Entrepreneur Magazine : "Hatching a Business"
Tammy is a former "Illinois Artisan"